The PDFs are available online (free of charge) through CSIRO Publications website. LINK. There is a link back to the book’s page on the CSIRO Publishing website for anyone wishing to purchase the hard copy. There is also a link HERE to the online files. There are two links to the book for anyone wishing to purchase the hard copy. LINK 1. LINK 2. 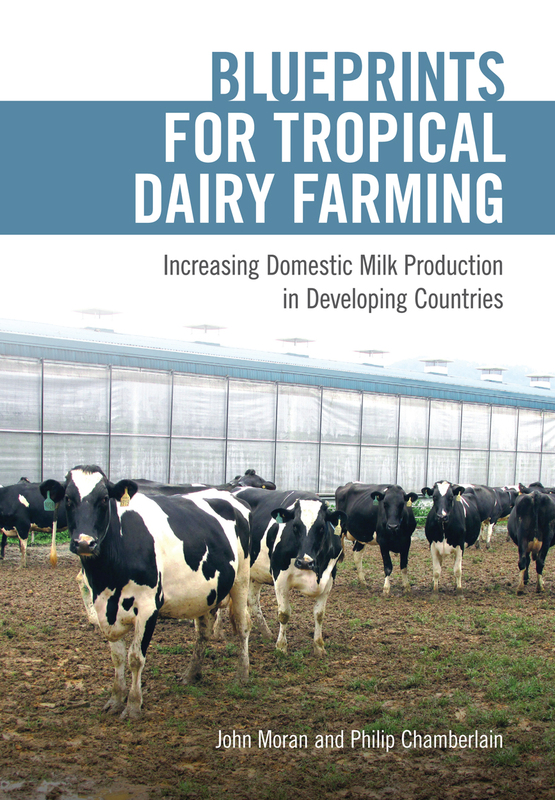 Blueprints for Tropical Dairy Farming provides insight into the logistics, infrastructure and management required for the development of small and large dairy farms in tropical developing countries. Farmers will learn how to improve the welfare, milk quality and productivity of their dairy herds. This book complements author John Moran’s five previous books on the principles of tropical dairy farming. 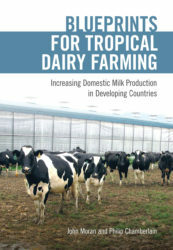 The manual covers a wide range of topics related to ensuring the sustainability of dairy production systems in tropical developing countries, such as South and East Asia, Africa and Central America. It also provides guidelines for the best management practices of large-scale, more intensive dairy systems. While smallholder farms are the major suppliers of milk in the tropics, many larger farms are becoming established throughout the tropics to satisfy the increasing demands for fresh milk. Blueprints for Tropical Dairy Farming will be a valuable resource for farmers and stockpeople who want to improve the productive performance of their dairy herds, farm advisers who can assist farmers to achieve this aim, educators who develop training programs for farmers or who train dairy advisers in the basics of dairy production technology, and other stakeholders in tropical dairy production, such as local agribusiness, policy makers and research scientists. National and international agencies will learn new insights into the required long-term logistics for regional dairy development, while potential investors will acquire knowledge into intensive tropical dairy farming. The aim of this manual is to improve the welfare of dairy cattle in tropical developing countries, and by doing so, optimise cow and herd performance. It gives the stockmen and farmers directly concerned with the cattle a better understanding of animal behaviour and the ways cattle communicate their comfort or distress. The book discusses normal cattle behaviour and shows how domestication and breeding can affect behaviour to achieve high levels of production of milk, live weight gain and fertility. Animal welfare is important for producers because it can affect the health, production and contentment of cows. Animal welfare practices which adversely affect cow and herd performance on tropical small holder dairy farms are identified. Advice is then given to change the animal’s environment or modify a handler’s technique to ensure cattle have the degree of comfort needed to achieve more profitable and sustainable systems of livestock farming. 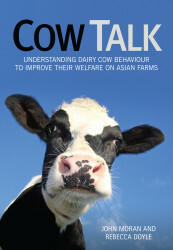 Cow Talk will be a beneficial resource for farmers who want to improve animal welfare, farm advisers who can assist farmers to improve their welfare practices, educators who develop training programs for farmers and dairy advisers, and other stakeholders in tropical dairy production such as local agribusiness, policy makers and research scientists. Dairy consumption in Asia has more than doubled over the last 25 years, and has led to more than 50% of the world’s total dairy imports now entering Asian markets. Consequently, Asian countries are seeking to improve their self-sufficiency in dairy produce by developing their local milk industries. Asian livestock importers are looking for increasing numbers of high grade dairy stock from established dairy industries in countries such as Australia and New Zealand. Unfortunately, a major problem encountered throughout Asia has been the poor performance of these exotic high grade dairy heifers when exported from their country of origin to a new, more stressful environment. This has been due to a failure to prepare for their introduction. Exotic dairy cows, particularly those from farms with high levels of herd performance, have high management requirements. If subjected to local and traditional small holder dairy farm practices, they are unlikely to produce acceptable yields of milk or may not even get back into calf. Poor management practices can lead to low growth rates, delayed breeding, stock diseases and even deaths among imported stock both before and after first calving. 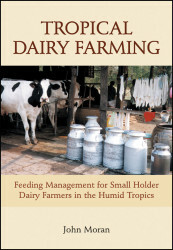 Managing High Grade Dairy Cows in the Tropics addresses the entire range of management practices found on tropical small holder dairy farms, highlighting those which are likely to adversely impact on heifer and cow performance, hence farm profitability. 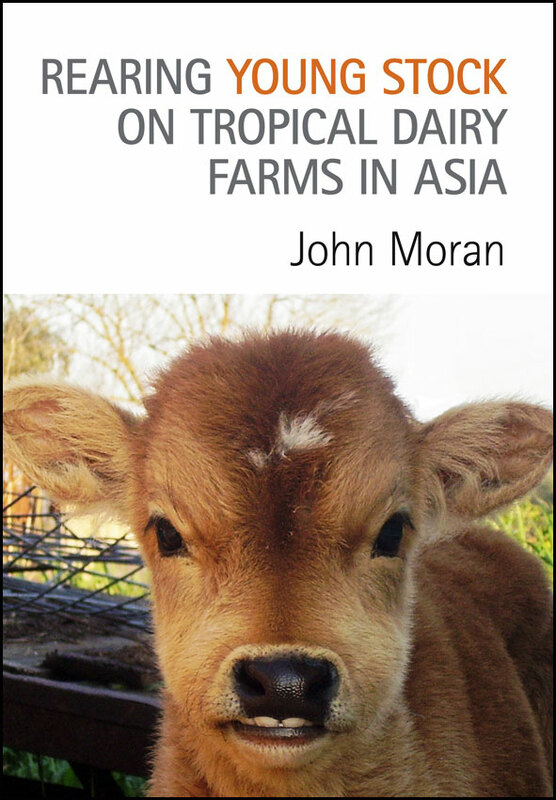 It is a companion volume to three other manuals written by John Moran: Rearing Young Stock on Tropical Dairy Farms in Asia, Tropical Dairy Farming and Business Management for Tropical Dairy Farmers. Rearing young stock for replacement heifers is probably one of the least well understood and practiced aspects of herd and feeding management on dairy farms throughout the world, particularly on small holder dairy farms in the tropics. This book addresses all the major concerns of the small holder dairy farmer in Asia. It shows how to attain optimal growth in young stock, so that as cows, they can calve at an appropriate early age at the lowest cost and promptly substitute for any cows culled from the milking herd. This provides continuing returns on the investments of feed, labour and other farm resources. Low reproductive rates and high calf mortality are the major causes of reproductive wastage. This has a direct bearing on culling and replacement strategies and on genetic improvement. In many tropical countries, calf mortality can be as high as 50%. In some areas this can be due to climatic stress on temperate or crossbred stock. While climatic stress compounds the other hazards of calf life, high calf mortality is usually due to diseases and poor feeding management. Rearing Young Stock on Tropical Dairy Farms in Asia encourages the small holder dairy farmer to maintain their investment in replacement heifers and gives them the tools necessary to achieve realistic targets for mortalities, live weight gain, mating age, and age and live weight at first calving. 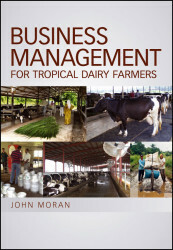 It is a companion volume to three previous manuals written by John Moran: Managing High Grade Dairy Cows in the Tropics, Tropical Dairy Farming and Business Management for Tropical Dairy Farmers. Most countries in South-East Asia have established smallholder dairy farming industries through social welfare and rural development programs to provide a regular cash flow for poorly resourced farmers. These farms are now being treated as accepted rural industries and require a more business-minded approach based on changes to farm profitability. 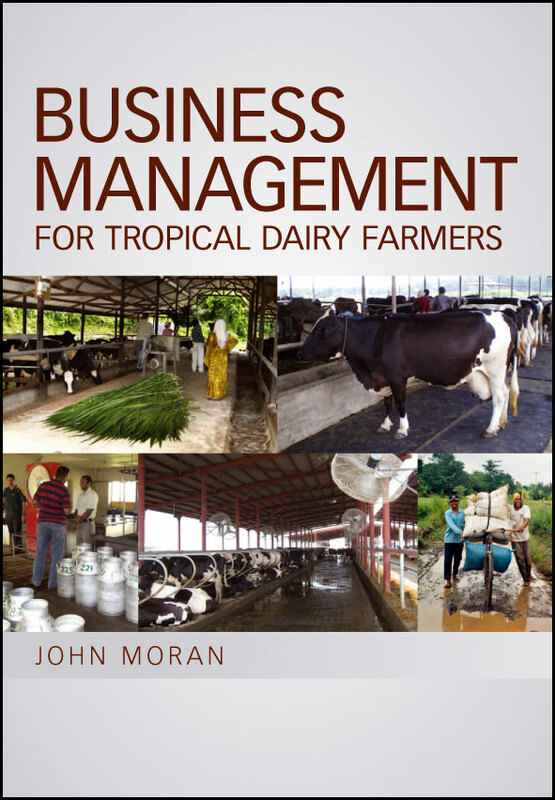 Business Management for Tropical Dairy Farmers gives smallholder dairy farmers the business management skills they will need to remain sustainable. Drawing on detailed financial analyses of smallholders in countries such as Pakistan, Thailand and Malaysia, it shows how to budget cash inputs to match cash outflows during different seasons of the year, and how to invest wisely in improving cattle housing and feeding systems. If farmers make greater use of formats and structures for farm costs and returns, it will increase their awareness of the relative importance of all their financial inputs in terms of cost of production per kilogram of milk produced on the farm. It will also allow them to make more meaningful and timely decisions by correctly costing planned changes to their routine farming practices. The book will also be of use to support organisations to more clearly define the key drivers of profit on smallholder farms, and to government departments and national dairy organisations to routinely evaluate and update their industry policies. 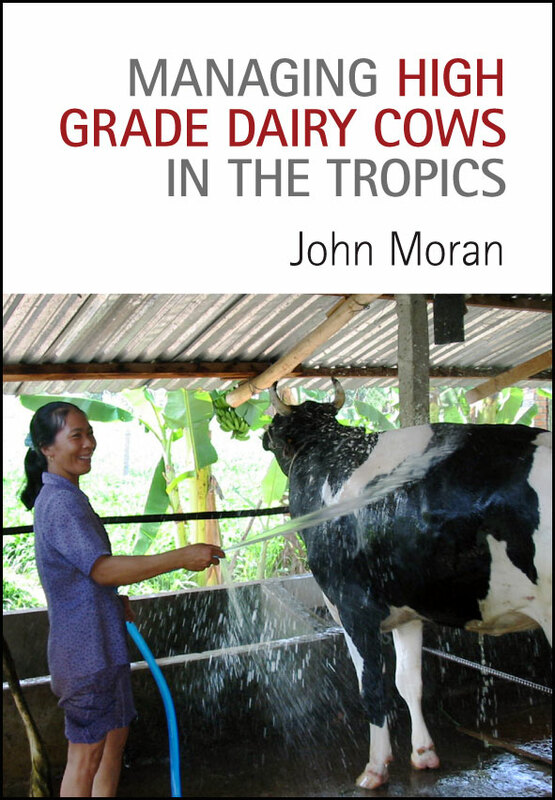 Tropical Dairy Farming is a manual designed for use by dairy production advisors working in tropical areas, especially in South-East Asia. It aims to increase the productivity of small holder dairy farmers in the humid tropics by improving the feeding management of their livestock. 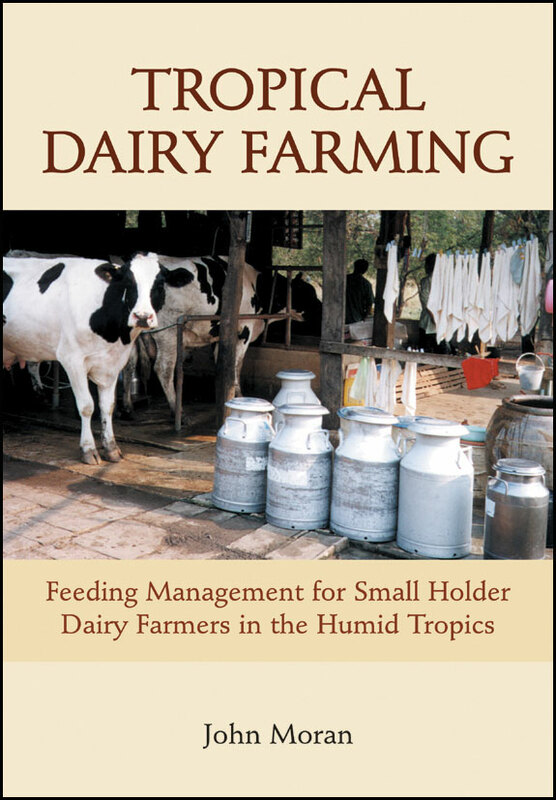 It shows how to provide dairy cows with cost-effective feeds that match small holder farming systems and discusses the major obstacles to improving feeding management in the humid tropics. The author shows the benefits and drawbacks of various feed components and the calculation of balanced diets based mainly on forages combined with some supplementary feeding. Diseases and problems associated with unbalanced diets are also covered, as well as important information on growing and conserving quality forages as silage. The book draws on examples from a variety of countries including Indonesia, Malaysia, Thailand, Vietnam, China, East Timor and the Philippines.